NIVIA Football, one of the most well known sports brands in India signed a Memorandum of Understanding (MOU) with the Football Federation of Sri Lanka (FFSL) as an official Football partner for National Teams and some other tournaments at the Football House.The agreement signing ceremony was attended by the President of FFSL Mr. Anura De Silva, Kishor Thaper the Deputy General Manager of Freewill Sports (Pvt) Ltd, Sourabh Gupta Senior Manager of Exports and Mr. Milroy Perera Chairman of Colombo Sports Company. Established in 1934, NIVIA is an Indian sports equipment manufacturer based in Jalandhar Punjab under the banner of Freewill Sports (Pvt) Ltd. The company produces athletic equipment such as footwear, apparel and accessories for multitude of Sports such as Football, Cricket, Hockey, Badminton, Basketball and Tennis and it has partnered with many National and International sporting events across India. NIVIA earned the FIFA certification for football in the early 2000’s and its’ ‘Ashtang’ and ‘Antrix’ Footballs were certified as FIFA Quality PRO match balls. Both of these balls are patented due to their unique features and design structure. “NIVIA is honored to be part of the rich history of Sri Lankan football and its ever-growing culture and passion for the sport. Sri Lankan Football undoubtedly has the potential to grow even bigger but this is a transformation that needs to start from a Grassroot level with the goal and the dream of being a player on a National and International platform,” said Mr. Kishor Thaper the DGM (Promotions) of Freewill Sports Pvt. 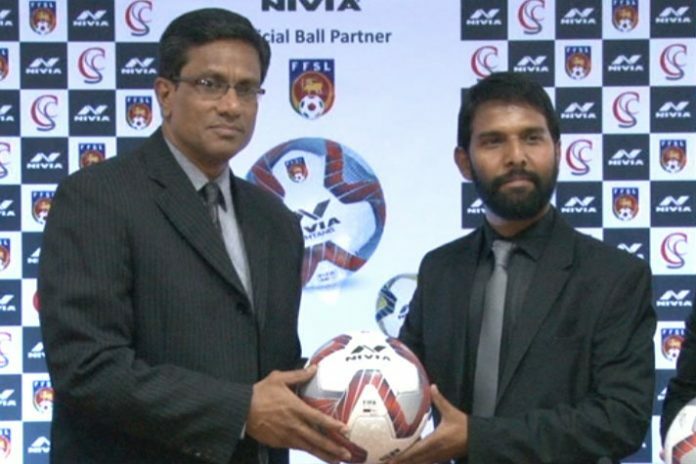 Ltd.
“NIVIA is proud to join hands with the Sri Lanka Football Federation as the Official Ball, and take forward its shared vision in a mutual effort to make our goals successful,” he further added.“We are glad on NIVIA, a renowned sports brand for partnering as the official ball sponsor for our National Teams and two other prominent league championships. We must be thankful to Freewill Sports Pvt. Ltd for their notable contribution towards the development of Sri Lanka Football,” stated the President of FFSL Mr. Anura De Silva. Last year, Nivia had signed three year deal with the Indian Super League (ISL) as official ball partner for the league. Under the terms of the agreement, NIVIA supplied the official match balls Nivia ‘Ashtang’ to the League and the ten clubs throughout the season.